Special thanks to Lorelle Caulfield Govoni for sending me this review copy. The story of Robert O. Caulfield is an interesting one. But you really can't tell just by looking at the immense collection of oil paintings featured in this 360-page hardcover. "Following his parents’ separation when he was in the first grade, Robert O. Caulfield was entrusted to the care of his alcoholic maternal grandmother. He spent the next six years under her tipsy supervision, running wild on the perilous streets of Depression-era Roxbury, Massachusetts. "Horrified by the neglect he was suffering, Robert’s paternal grandparents adopted him when he was on the verge of adolescence. Overnight, Robert moved from a cockroach-infested hovel to a roomy house in a comfortable suburb on Boston’s North Shore. Despite the middle-class comforts that transformed his life, the wounds inflicted by his childhood would never completely heal. "A gifted athlete, Robert was a reluctant student who turned down scholarship offers from Harvard and Holy Cross. After a stint in the Marine Corps, he eloped with his high school sweetheart, Marilyn Le Blanc. 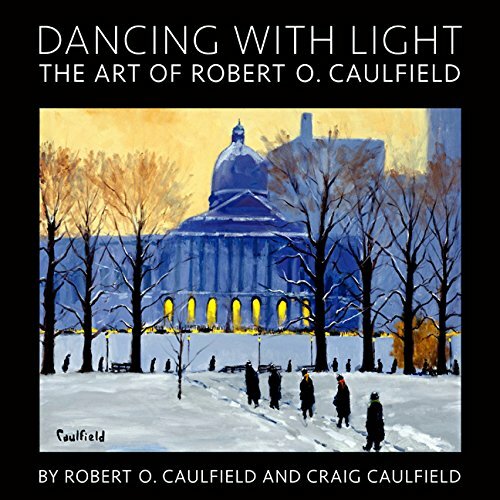 During the first few years of their marriage, Robert studied art at night in Boston. Those studies ended when the financial demands of his growing family took precedence over his artistic dreams. "Over the next thirty years, Robert worked his way up from laborer to upper management in a utility company. Working sixty-hour weeks to support his family, he grabbed time to paint whenever he could, exhibited his landscapes locally and sold about five paintings per year. Although Robert sometimes struggled with self-doubt, Marilyn’s faith in her husband’s talent never wavered. "Marilyn persuaded Robert to take early retirement shortly after one of his paintings received national exposure in Yankee magazine. Together they opened an art gallery in Woodstock, Vermont showcasing Robert’s work when he was fifty-six. Their partnership proved spectacularly successful." The struggle of being an artist is real. His struggle has made him the artist he is today. I could almost sense some angst, frustration and maybe a little uncertainty. The caption for a self portrait was "Your average, working-class, tortured artist". The description on the back of the book has him wondering if he "had something unique to offer as an artist." This book covers his life and career from 1930s to 2010s in detail. And despite the struggles and challenges, he was still able to produce an incredible amount of work. That is quite inspiring. The paintings collected in the book are from 1950s to 2017. He paints mostly landscapes and seascapes. Many look like European towns, villages and parks. It's difficult for me to describe his style except to say there's lots of textures. You can check out the photos of selected pages I've listed below. The highlight of the book for me is his work rate and his love for art. It's an impressive collection.